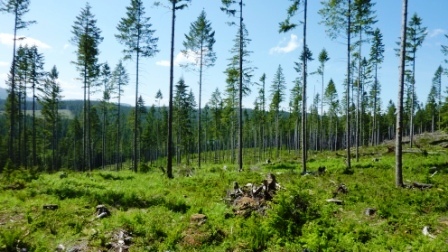 Data for this study case were obtained at the Silviculture Treatments for Ecosystem Management in the Sayward (STEMS) long-term experiment located in the Sayward Forest near Campbell River on Vancouver Island, BC. The STEMS experiment is part of a larger study done in co-operation with the U.S. Forest Service, Pacific Northwest Research Station, Olympia Forestry Sciences Laboratory. STEMS field experiment was created to provide a quantitative assessment of alternative silvicultural methods to determine the extent to which VHR could meet multiple management objectives. STEMS field experiment was created to provide a quantitative assessment of alternative silvicultural methods to determine the extent to which VHR could meet multiple management objectives. The STEMS experiment is located within the Sayward landscape unit (112,000 ha). The forests within the unit are dominated by 40 to 80 year old second-growth stands (63%), originated from either clearcutting or wildfire. Old-growth stands occupy only a small percentage of the landscape and are largely restricted to higher elevations. The STEMS experiment is located in the Coastal Western Hemlock (CWH) biogeoclimatic zone, where the dominant tree species are western hemlock and Douglas-fir. The Sayward forest also has high recreation value as well as being a source of non-timber products (e.g., mushrooms). Population growth in eastern Vancouver Island is expected to add pressure to the forest’s ability to meet multiple-uses and maintain ecosystem services. Duric Humo-Ferric Podzol in Sayward Forest. 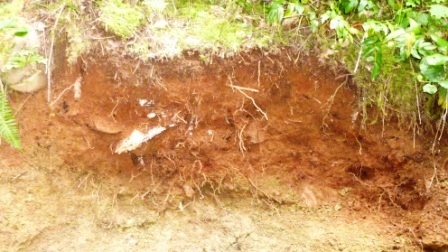 The study sites are located in a region with a humid, maritime climate, on a loamy sand Duric Humo-Ferric Podzol. Typical Duric Humo-Ferric Podzols, like those within the Sayward soil series, would have the properties as indicated in the table below.